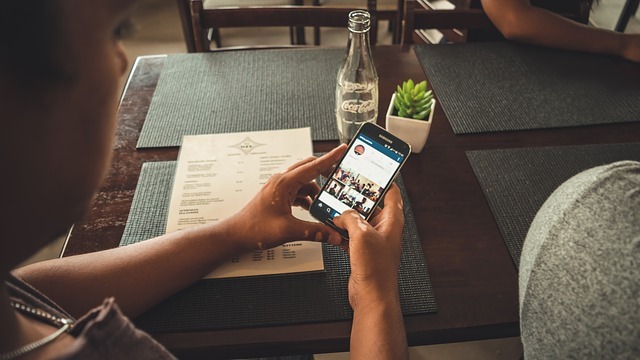 With the huge increase in smartphone use, losing a phone has become a normal thing. Everyone loses their phone sometime. And with the higher end devices, smartphone theft is also becoming widespread, so much so, that you can actually buy insurance for your phone. When you suddenly lose your phone, sometimes it becomes hard to take the right steps quickly. How do you find a small lost or stolen android device if it is not responding to phone calls? If you are an Android user, here is a list of things you can do if you have lost your phone, or if your phone has been stolen. You may also have undergone the ‘lost phone experience’ in the past, so continue reading to learn how you can use the latest tools to help you protect your phone in the future, be it loss or theft. Try remembering where it was that you last used your phone and search the place thoroughly. Inform all your contacts that your phone has been lost. Being an android user, you most probably have your contacts safely backed up with Google. Use the ‘Logout of all devices’ feature on Facebook and any other social network whose app you had installed on your phone. As an added measure change all your passwords too. There might be chance someone has found the phone and is looking to return it to its owner. 2. Using Android Device Manager. Log onto the Google Play Store on a computer and go to the Android Device Manager. (Click on the Gear icon in the navigation bar and then click on ‘Android Device Manager’). This would show you your device’s last detected location, the time it was last detected. If you have the Android Device Manager App already installed on your phone and made system administrator (See Below), you can also erase, lock or ring your phone from the browser window itself. 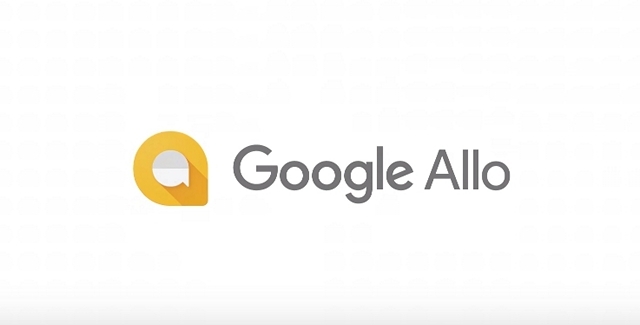 The only prerequisite is that your android device is still signed into your Google account, so if your device is stolen, and someone has signed out of your account, this method is not really effective. 3. View your Google location history. This will help you identify where your phone was last seen, and if it still is signed into your Google account, it will be updating its location information to Google. This is a possible alternative in case android device manager fails. 4. Remotely install a security application. To do this, your device must be signed into your account, and be connected to the internet. There are many great apps for this, but Android Lost is the one that stands out. It can remotely control nearly every aspect of your phone (And shows up in your launcher as Personal Notes). Full details given in the section below. Law Enforcement Agencies can track down a phone, provided you have its IMEI (International Mobile Station Equipment Identity) number. If you don’t know your phone’s IMEI number, it can be found on the box the phone came in. If you own an Android wear smartwatch then you can try calling your lost/misplaced phone by installing Google Device Manager in your smartwatch. All you have to do is to say is ‘Ok, Google. Start. Find my phone, and your phone will start ringing. Note: This feature is not yet available in all Android wear devices but it will be made available to every android based smartwatch within a couple of weeks. Most phones come pre installed with ADM these days, but if your phone does not have this app, do install it immediately. Android Device Manager is a Google App which lets you remotely lock and track your phone. It also has a handy feature to force your phone to ring. After installing Android Device Manager, add it to your list of system administrators, so you can use it for magical things like erasing your phone if it has been stolen. We have already discussed on how to use ADM to find/erase your device. Go to the security tab of settings. 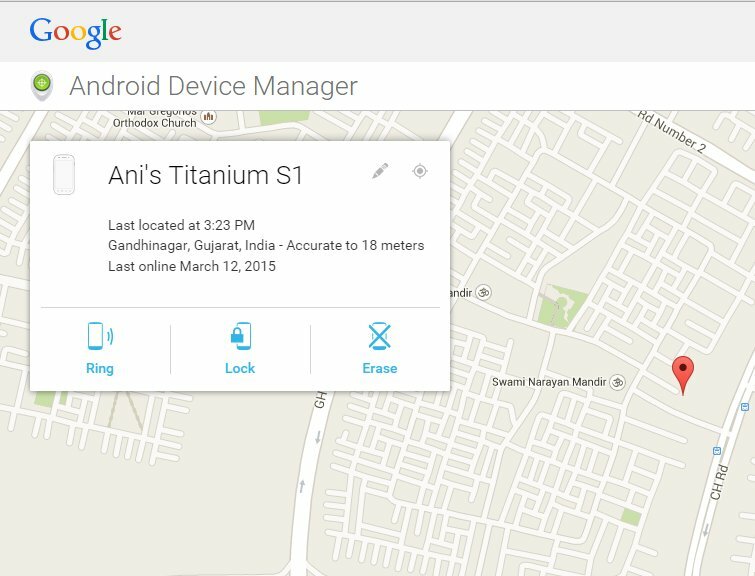 Select the check-box for ‘Android Device Manager’. Note: By doing this you give ADM full control of your device. 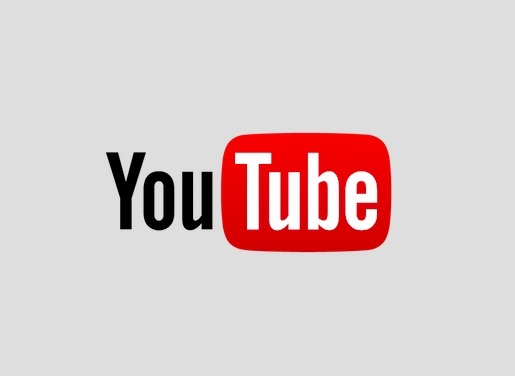 It now has full access to do nearly anything with your android smartphone/tablet. 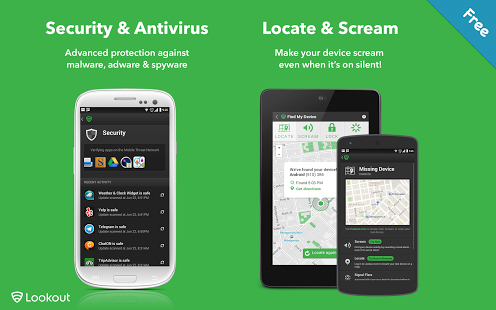 This is an all-in-one app for securing your phone against theft or loss. 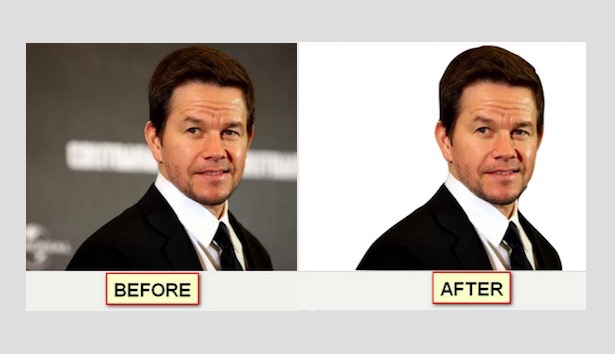 Feature-wise, it beats ADM hands down. Most features are fully free, but you will need to pay for using the remote shutdown/restart feature as well as to take remote screenshots. As of now, Android Lost lets you try the Premium features free for a week. Needless to say, if you can trust Android Lost enough to install it on your phone, locating a lost phone becomes child’s play. Although there are ways that even Android Lost can fail, if, for instance you lose a phone that is out of charge and no one finds it. Also, If your phone has been stolen, and you have NOT hidden this app, you can wave goodbye any chance of using Android Lost to recover the device. 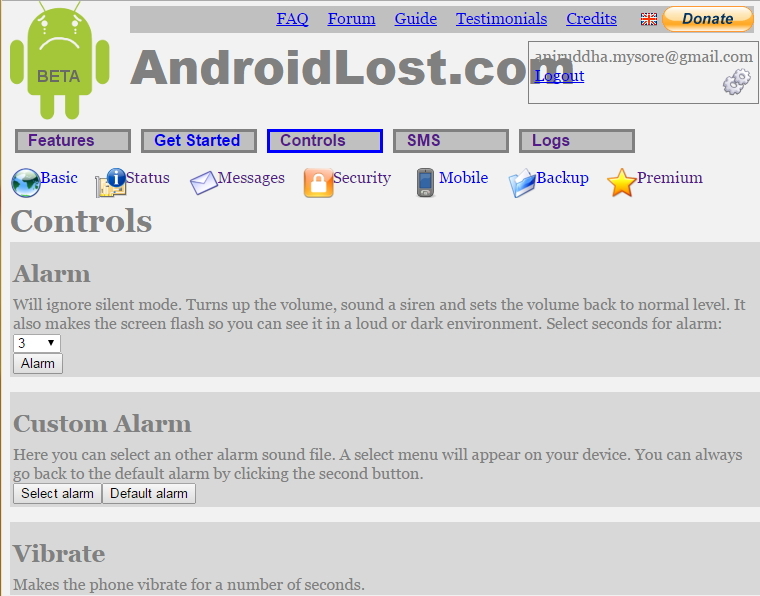 Android Lost can be controlled either through the web interface, or by SMS. Just log into the web interface with your Google account and go on ahead to the Controls tab. 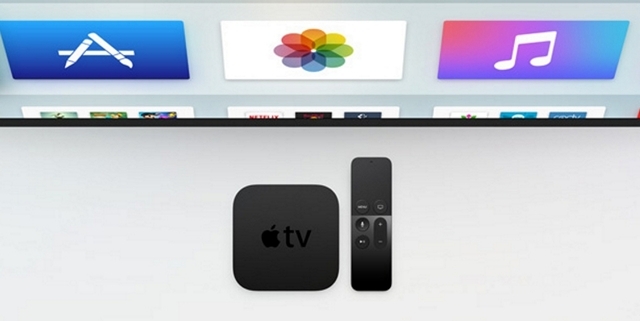 The interface clearly does not win any points for design, but it does pack several powerful features. The custom alarm is very interesting for sure. You can also set an overlay message as well as a boot message for your lost phone ‘in-case a friendly guy finds the phone‘ as the Android Lost website puts it. A plethora of excellent features, but ultimately requires you to pay for the pro version if you actually want to use any of the more useful features like remotely locking/wiping your SD card, or taking pictures with your device camera. This app has most of the features Android Lost has, although it cannot turn off the phone’s Wi-Fi connections or GPS. A free app to help locate your android smartphone. It tends to work better with older versions of android than some other apps. 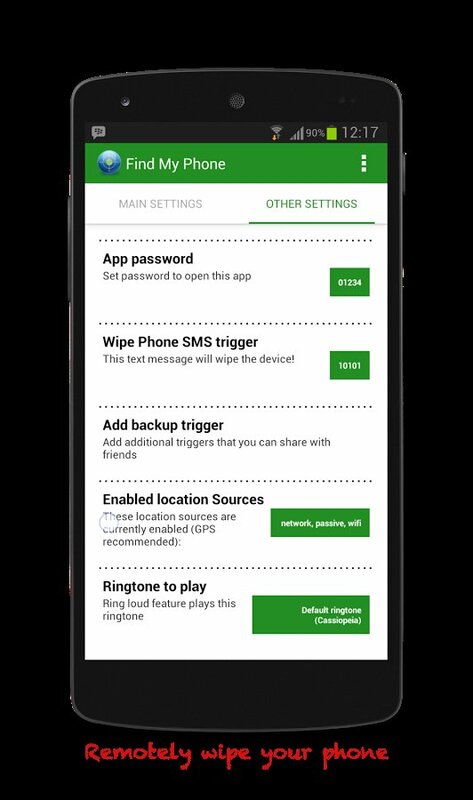 The developer also has a Pro version of the app called ‘Find My Phone – Anti-Loss Pro’ which offers an ad-free experience with some extra features like remotely tracking the phone battery usage. Most Antivirus and phone security apps also include features to help track, and erase a stolen phone. These are mostly paid apps which claim to be all-in-solutions for all your phone security issues. If you’re interested in this category, only use apps which have been released from trusted companies, because after all, the best way for a hacker to spy on you is by having you install an app that claims to protect you. We will not go into these apps here as they form an entire app category on their own. In the end, luck plays a big part in recovering a lost or stolen phone. If your phone has been stolen, it is usually not wise to directly confront the thief, or so most law enforcement agencies say. Below, we have listed some of the most frequently lost android smartphones. We hope our tips help you find your precious smartphone. Please share this article if you found it useful, and do comment below if you any queries.